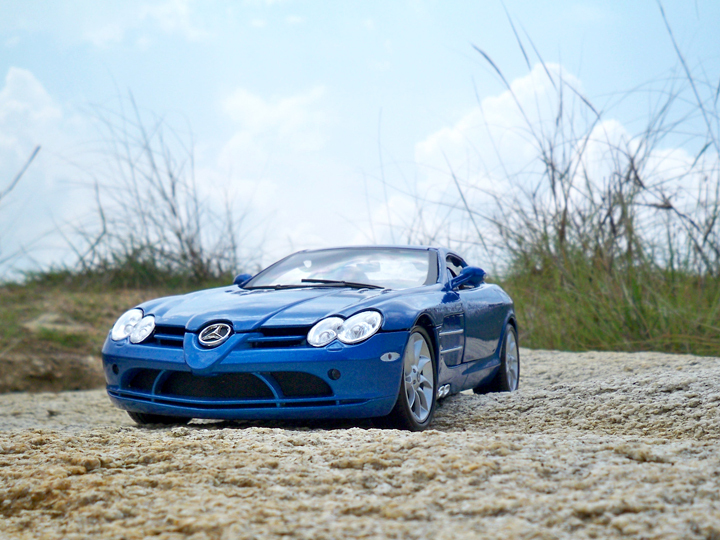 A web site dedicated to Diecast Car Collection, photography of scale models and sharing of this hobby experience. 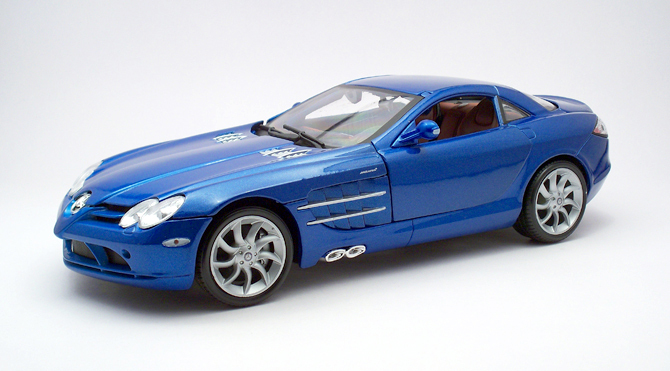 This includes models from Autoart, Maisto, Bburago, Welly, Newray, Kyosho, Minichamps, Hot Wheels, Motor Max and Jada etc. 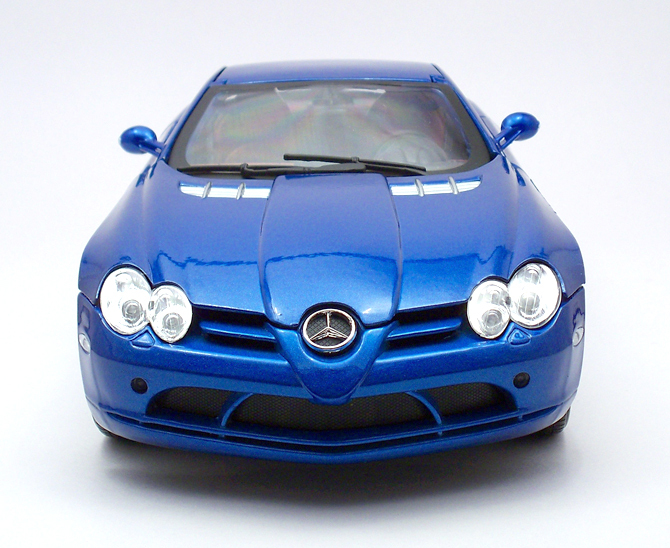 The Mercedes-Benz SLR McLaren is a front mid-engined supercar developed by Mercedes-Benz and McLaren Automotive. It was inspired by the Mercedes-Benz 300 SLR of 1955 and named after the road-going 300SL Gullwing, SLR stands for “Sport, Leicht, Rennsport” in German which means “Sport, Light, Racing”. The SLR sports a hand-built 5,439cc supercharged all-aluminium V8 engine which generates a maximum power of 626ps and maximum torque of 780nm. The Lysholm-type twin-screw supercharger rotates at 23000 revolutions per minute and produces 0.9 bar (13 psi) of boost. All this power is feed to the rear wheel via AMG SPEEDSHIFT R 5-speed automatic transmission with 3 manual modes. The entire body is constructed using carbon fibre to keep the weight low. McLaren claims this SLR can reach 62mph (100kmph) in 3.8secs and a top speed of 208mph.The car’s base price of £295,337 in UK, made it the ninth expensive street legal car in the year 2008. The original arrow head driven design is very well captured in this mighty model. Many of fellow collectors felt that this blue shade is kind of not so appealing as the other shades like silver and black, but to me a model should look flashy both in case and also under spotlights. The excess gaps between the panels are kind of annoying in times but I am one of those unlucky ones to get this model with gaping issue as most other have commented that they have not experience such issues with the panels. 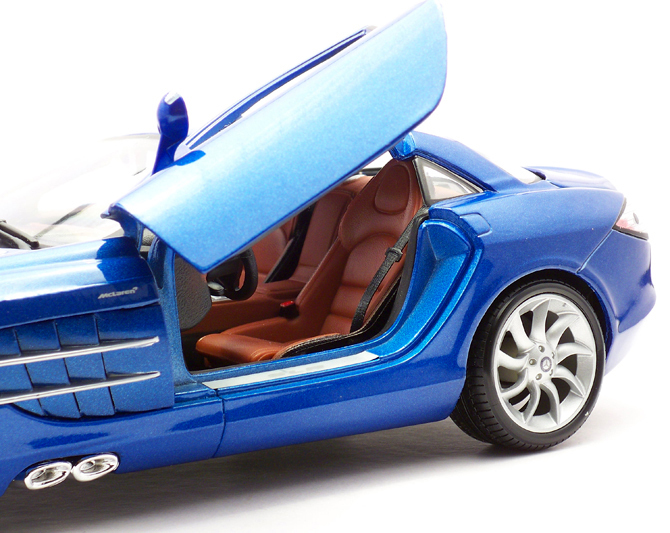 The scissor door is the most aesthetically appealing part of this model and the original car itself, which is quite novel to this model as the conventional hinge mechanism cannot be utilized here! Maisto has deviced an all new hinge design to make these door look good at the same time function proper without spoiling the aesthetics of the car in any way. Bravo Maisto, Bravo. The aggressive air vents and the chrome tiped exhaust takes all the cake but I feel the alloys are the real star! because the original shape is well replicated and details like five screws and Merc logo in the center are brilliant. 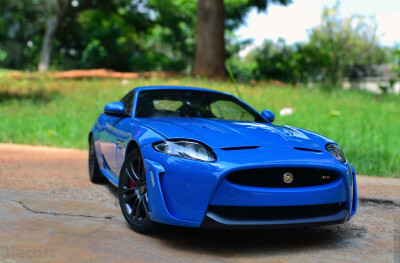 In the profile view the cars purpose oriented designed is depicted in all possible manner let it be the low slung styling, aerodynamic body or the longish hood to hold that massive V8 engine. The low profile tires also stands out but again the alloys steals the show. The interior is also nice, thanks to tricolor treatment and some detailed engraving. 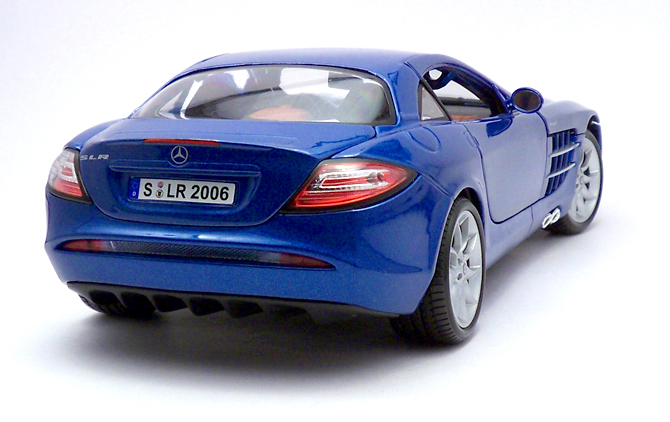 The steering is superbly detailed with controls distinguished and the Merc logo adds beauty. The center console is nice, I personally like the SLR badging in it which is sharp and smudge free. The upholstery is made in orange shade which adds sportiness to the interior, kudos to the Maisto because these color combination were never produced in this car. Seat belts are also nice touches and its dimension is well matched to the overall car and seat’s size. 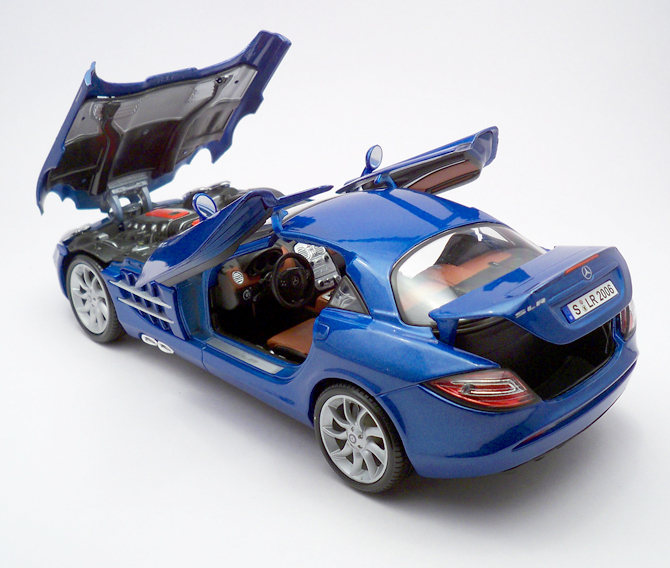 This SLR model has opening doors, hood, trunk and functional steering which is very common now a days in 1:18 scale diecast models. The trunk is a disappoints me as it open up very little. 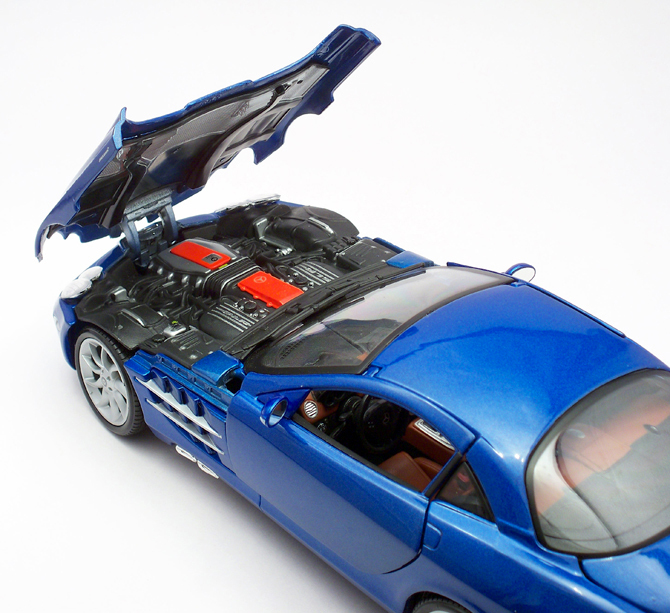 The hood is quite detailed in a way it opens, under lining black material which most diecast makers misses even Maisto. The engine is detailed nicely but its the red additions makes this engine standout. Aluminum strips and SLR engraves here arent sharp and smudge all over which makes it hard to make out what it reads. But a very nice effort in this department as well. The rear-end also follows the same line of details as the front and on closer observation you can even see the speaker grills through the rear glass. The tail lamp is detailed and LED treatment is superbly replicated. 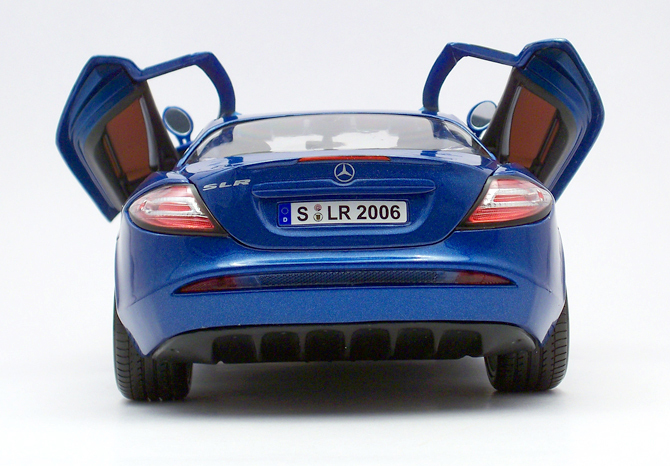 The other important feature at the rear which got my fancy is the license plate which reads SLR 2006. 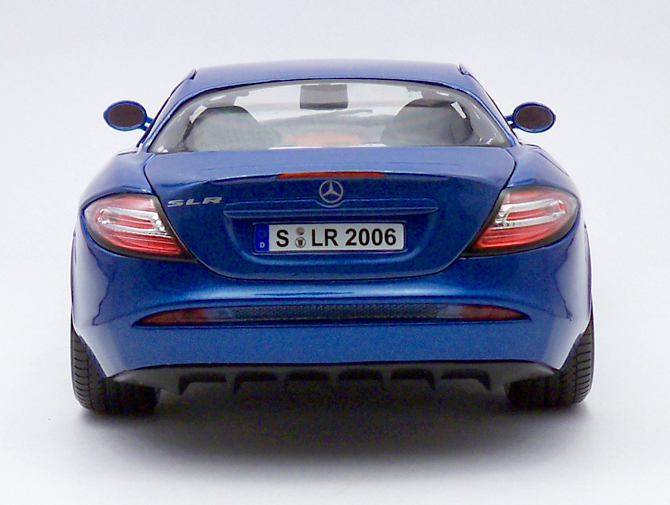 The SLR badge and three pointed star in the middle are smart in terms of dimension placement and sharpness. The boot mounted stop lights could have been in a lighter shade probably a translucent material would have be appreciated but this is definitely not a show breaker. This low slung shot showcases how proportionate this model is! 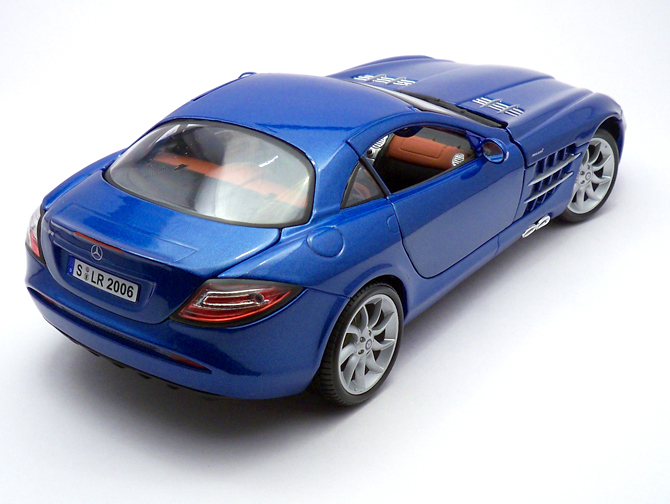 though the rear view mirror is kind of misaligned but come on this is just a scale model not a real car from Mercedes-Benz. The tires thread pattern is nice, deep and detailed. The rear aerodynamic duct is nice and give this rear view some more details to talk about. 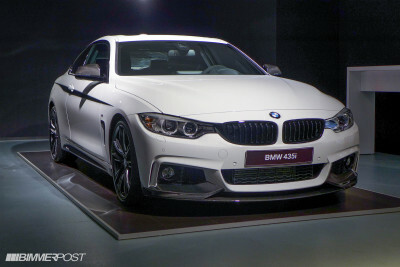 gr8 car and awsum pictures… but where did u get it for 1450 bugs…?? i got it at 1650..
too bad no pop up spoiler, but still great anyway. this should be the premiere edition right? Yes you are right! Popup spoilers would have been nice but that will sacrifice boot so I am ok! SLS AMG in black can be found in ModelArt Delhi, If interested in online purchase try http://www.dreamcarmodels.com who for sure have one and the service is promising. 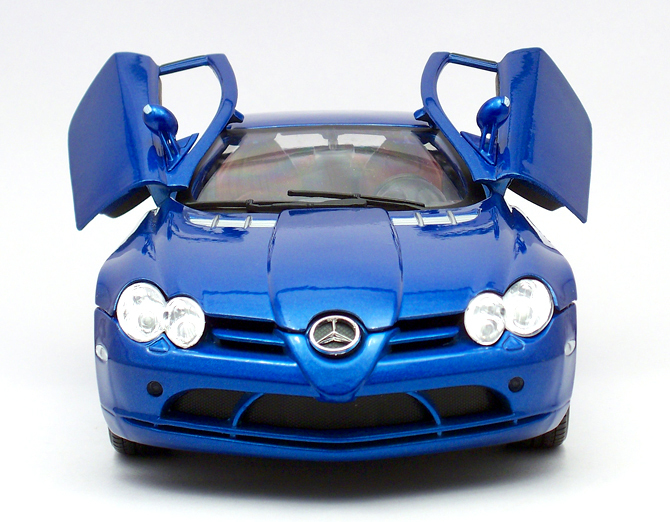 Dreamcarmodels.com get 5/5 score I got my Lotus Elise, Jeep Sahara, Porsche Cayman S and more from him. 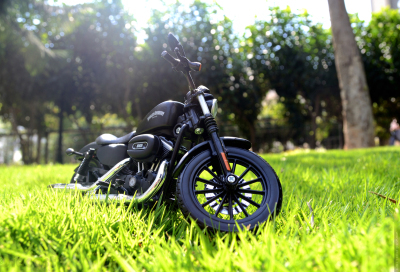 He being a collector himself the package is impeccable… All my models came to me in superb condition.